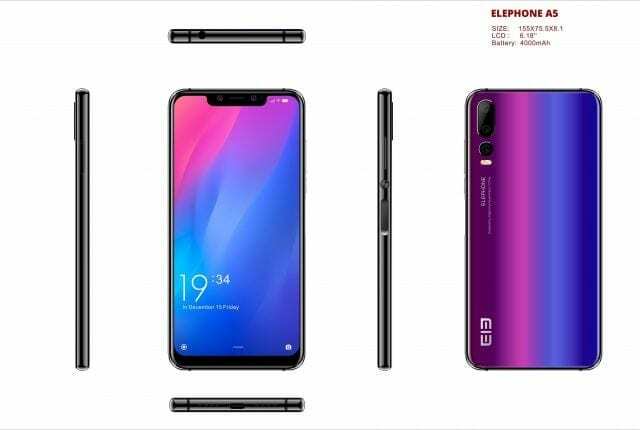 Elephone A5 Lite has not been released yet. However, the smartphone features are now well known through leaks and pouring in on the internet. Fans are already guessing what the price could be. Two good things to love when this device is in your hands is the notch display, and the triple camera at the rear, plus the two cameras at the front of the phone. Elephone A5 Lite comes with big screen and large battery. This device is 4G network supported. However, we are going to see other aspects of the camera, design and display, performance and battery features in Elephone A5 Lite. Here is a smartphone that has mainly plastic body design. The dimensions are 155 x 75.5 x 8.1 mm and it weighs 160 grams. It comes in black, blue, and red colors. The smartphone is not water resistant but it has fingerprint sensor, and has face recognition technology. Display type is IPS LCD capacitive multi-touch screen. There is no secondary display. The screen size is 6.18 inches, the pixel density is 272 ppi, and the aspect ratio is 19:9. The screen comes with 16 million colors. Pixel resolution is 1520 x 720. Other good features are 2.5D curved glass, notch display, and 81.7 percent screen to body ratio. The primary rear camera is triple setup of 13 MP, 2 MP and 2 MP and these come with LED flash, while the secondary front selfie dual camera is 5 MP plus 2 MP and this comes with display flash. The video performance in Elephone A5 Lite is 1080p@30fps. Other good camera features are geotagging, auto focus, HDR, touch focus, face detection, and panorama. Android OS v8.1 Oreo may be the operating system in the Elephone A5 Lite. However, most likely it will come with Android 9 Pie. For hardware, there is MediaTek Helio A22, which comes with process technology 12nm, 64-bit architecture. Also, there is 2.0 GHz Quad-core Cortex A53 and PowerVR GE8300. Elephone A5 Lite comes in two variants and one is 3GB / 16GB, while the other is 3 /32GB. However, the internal storage of 512 GB can be expanded up to 128GB through a micro SD card to be used inside SIM 2 card slot. Sensors in the device include accelerometer, proximity, fingerprint, compass, and ambient light. Supported network in this device is GSM, HSPA and LTE. That is to say that the Elephone A5 Lite is capable of handling 2G, 3G and 4G networks. Also, to support this, there is dual nano SIM card slot space made available in the device to make for smooth running of networks. Other connectivity elements are Bluetooth v4.1, Wi-Fi, mobile hotspot, GPS, A-GPS, GLONASS, headphone jack, and micro USB 2.0. However, there is no infrared, NFC or HDMI in the device. Powering the device is a Li-Po 4000 mAh non-removable battery. The talk time and standby time are not specified yet. However, there is no wireless charging but there is fast charging technology in the device. The price of Elephone A5 Lite is $189.99 USD. However, we cannot assure that this price is official, or it remains constant or that you will find it thus in most stores. For availability, the smartphone is not yet available for purchase because it has been announced and will be released in the month of December 2018.